We live in a time that the Trumpets are blowing; and we are blowing them off. We were told about the trumpets so that we would recognize the signs; heed the warnings; and finally do what God instructed us to do from the beginning – before it’s too late. We listen to mad-scientists with their knowledge, falsely so-called, because it isn’t knowledge inspired by God. These experts tell us all kinds of lies fueled by hidden agendas and hidden hands. They manipulate the truth. War isn’t good; it’s bad. Everything about it is bad. We just need to look at man’s science in relation to the Signs of the End Times to see the shocking truth. Chernobyl is in the Ukraine; and in Ukrainian, Chernobyl means Wormwood. The third angel sounded on April 26, 1986, when the Chernobyl Nuclear Power Plant exploded and was burning, releasing massive radioactive particles in the air that spread into the atmosphere and eventually fell to the ground, contaminating land and water. Waters became radioactive from Chernobyl, and contaminated with deadly uranium. The particles reached to the Alps and other mountains that are water sources, fountains, for the underlying lands. It began with a power-surge in reactor four, located near Pripyat, Ukraine. An emergency shutdown failed and another surge occurred, rupturing the vessel and causing a series of steam explosions, all of which caused the moderator of the reactor to ignite. Once it did, the fire sent a plume of radioactive particles into the atmosphere and over a large geographical area. Russia didn’t admit to the explosion until it set off alarms at the Forsmark Nuclear Power Plant in Sweden, sparking questions. Some reports claim that the government cover-up of the disaster was the catalyst for Glasnost, which led to the Soviet collapse. The government claimed things were being remedied. And once they started evacuating, they claimed residents could return in about three days. That didn’t happen. Official Soviet investigations became questionable, not only about the dangers to people, but also to the environment. And the health and environment concerns remain to this day. They claim 31 people died due to the explosion; glossing-over the thousands upon thousands who have died from cancers caused by contaminated waters, soil and air. Years down the road, we learn that the developers of the plant considered what happened to be impossible and didn’t create any safeguards for prevention. Contamination from the accident was scattered, with deposits being found in the Alps and Welsh mountains and the Scottish Highlands. Sweden and Norway received heavy fallout from rain. Even in 2009, thousands of livestock in Norway needed to be fed uncontaminated feed before slaughter, to ensure they were safe for human consumption because plants on their pastures were still contaminated from Chernobyl. And even in 2011, slaughter restrictions remained on sheep raised on contaminated pastures in Britain and Norway. [Wikipedia]. While this horrible disaster caused death and disease, illnesses and short life-spans, it also caused miscarriages, stillbirths and birth deformities. None of these horrors have gone away. They still persist. Sadly, Chernobyl is just a drop in the ocean compared to the tidal wave of the Fukushima disaster. To this day, we don’t know the toll Chernobyl’s had on the world; and we are even farther from knowing the true devastation that will be caused by Fukushima. But it will come to the point that if God doesn’t intervene, no-one will be left alive, just as scripture says. Our world is mutating into something even the Prophets couldn’t grasp. While they had already seen the effects of atomic power on Hiroshima and Nagasaki, the insanity of Japanese scientists and politicians building nuclear power-plants in their country that is renowned for earthquakes is mind-boggling. To the simple world of old, looking into the future would be frightening, not to mention hard to describe. In Revelation, when the Fifth Trumpet sounded, John saw the Invasion of Kuwait, with its great furnace of smoke rising out of the pit, because the smoke plumes from the thousand oil wells burning blackened the mid-day sky. He went on to describe the war helicopters as locusts and scorpions, as detailed in “The Invasion of Kuwait in Prophecy” by JAH. It’s important to note that a Trumpet sounding represents the start of a time-period, a change in the times by a marked event in the world. It starts and continues. With how dangerous nuclear energy is and with its power to wipe out ALL LIFE forms, was it really necessary when we could have free safe energy from Tesla and others? The world was given ways to create free energy that doesn’t harm, but its man-handlers force the most dangerous ones on the world, in their vying for control. The wars in the Middle East are about the control of oil, and now most likely natural gas too. But they are using an energy they cannot control to try to control the ones that they think they can control. Military ammo used in all these modern wars are made with the nuclear waste, and leaving depleted uranium all over the targeted areas, poisoning millions in the Middle East. Allied troops are being poisoned from exposure too. This exposure goes back to the Gulf War, Kosovo, Bosnia, and Balkan Wars. And just like Russia played down Chernobyl, Western governments play down the effects of their military pollution, depleted uranium, citing, “no scientific proof… just wear a mask and wash your hands”. They don’t even bother to clean up the radioactive debris; and children are playing on abandoned tanks, shelled with DIRTY AMMO. This kind of contamination is after the fact; as it doesn’t even address the dirty dust that went into the air on impact; where most of it went into the air in a firestorm of DU oxide particles, and spread in the wind to be inhaled and absorbed by all life in its path. It can remain in human organs for years. The West says this radioactive debris is just a necessary risk of war, a necessary part of modern warfare. Dirty ammo is basically bullets and shells made with depleted-uranium, a low-level radioactive nuclear by-product material left over from the making of nuclear fuel and weapons. It is so dense that it can penetrate through armor. There are definitely discrepancies on investigations conducted by government-hired experts, and what other, independent scientists, report. Guess who says what? Hint: those who want war find no problems and show little concern; even to the point that American veterans’ health concerns are shunned aside and the birth-defects in the vets’ offspring are kept quiet. Uranium poisoning isn’t going away, for anyone, not for Chernobyl victims, not for Gulf War vets, not for Middle Easterners, and not for the inhabitants of the world dealing with Fukushima. It has a half-life of 4.5 billion years! 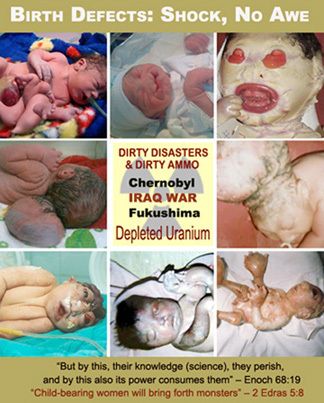 There are pushes to ban depleted-uranium, calling its use a war-crime and a weapon of mass destruction, as its lasting effects essentially make it one, because it’s inhumane and has unduly negative effects on the natural environment. These efforts are being blocked. Who’s blocking them and why? It would make one wonder if nuclear power plants and even uranium mines are owned, or operated, by the industrial war complex and the like: like investors. They will not be able to hide how destructive depleted-uranium is in the long-run, just like they will only be able to downplay Fukushima for so long. “This whole thing is a crime against God and humanity,” said Dr. Doug Rokke, an Army health physicist, who was charged with the depleted-uranium cleanup in the Gulf. He was one of about 100 who cleaned it up without protective gear. His quote is the Seattle Post-Intelligencer article, Iraqi Cancers, Birth Defects Blamed on U.S. Depleted Uranium, by Larry Johnson. When the article was written in 2002, about one-third of his crew was dead and the others had serious health problems. He said the government was lying about its claim that consequences of DU were unknown. They were warned after the Gulf War. “DU is a snapshot of technology gone crazy,” Rokke said. 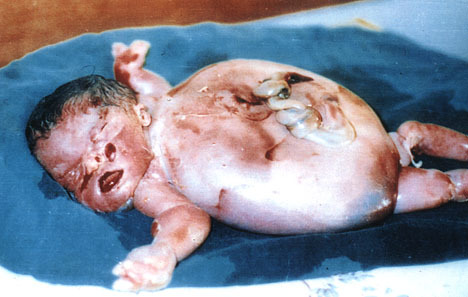 Each photo of a baby born with birth-defects from depleted-uranium poisoning, like those in Iraq, should act as an official 1000-word report that DU is harmful and deadly. This is reality, whereas no weapons of mass destruction were found in Iraq; and no conclusive evidence has been presented to indicate Assad used chemical weapons. Yet, the West (and Israel and Saudi Arabia) want to Shock and Awe Syria too. Shock and Awe to show we are big and bad. Well, the world knows that by now. We are bad to the bone. And this doesn’t even address the white phosphorus supposedly used to illuminate the battlefield, but fries skin to the bone on contact. Wonder who produces it? Babies in Iraq are being born without brains, with their internal organs outside their bodies, and without spines. Is this the example we want to set? Big and bad? Father meant for His blessed nations to spread His Word, not spread contempt and inhumane suffering. These atrocities are being done in the nations’ names for materialism and obscene-wealth for a few. Insanity defies logic as we condone the use of weapons of mass destruction to stop the use of weapons of mass destruction. Well, just the accusation can cause a war in these modern days. And little countries are disarmed of their weapons before war, just like little people are disarmed of their guns before martial law. Same tactic, different battle. The West is going to reap what it sows. The Bible says Israel will be punished, Israel being God’s children and metaphorically His wife. They are descendants of the Tribe of Israel from Jacob’s twelve sons, who live in the once-blessed countries, not in a little fake State created by man in 1948, when the Fig Tree grew new shoots, but would never bear fruit, as Jesus spoke of in the parable about the Fig Tree. He said, when this happened, His time would be near. But the once-blessed countries will be overcome and killed for their treason and adultery against God, as well as their inhumanity against their brothers. The two witnesses are killed: America the Great and Great Britain, God’s Two Witnesses that used to translate and spread the Holy Word all over the world; but communism, the beast, kills them from the inside and out (Rev. 11:7). And the world rejoices at their deaths, “And they that dwell upon the earth shall rejoice over them, and make merry, and shall send gifts one to another; because these Two Prophets (“Olive” trees) tormented them that dwelt on the earth (Rev. 11:10).” Yeah, we tormented them, because we want it all, gold and wealth, stuff and things, oil and power. We may not be paying attention to what is done in our names, but the rest of the world most certainly is. As long as the government and media are ignoring the big picture, we think we can too. We are headed for WW3, because someone wants war. We ignore the Biblical interpretation that Syria, Iran, Iraq and Turkey are the Four Angels (countries) bound by the River Euphrates. “Saying to the sixth angel which had the trumpet, Loose the four angels which are bound in the great River Euphrates. And the four angels were loosed, which were prepared for The Hour, and The Day, (the month, and the year) for to slay the third part of men (Rev. 9:14-15).” This is the point of no return. The Third Trumpet sounded with Chernobyl; the Fourth Trumpet sounded with the break up of the United Kingdom and its related nations; the Fifth Trumpet sounded with the Invasion of Kuwait; and the Sixth Trumpet sounds with the rise of Syria, Iran, Iraq and Turkey, the catalyst of the great war. By the way, there are only Seven Trumpets, with the seventh being The Reaping. The Sixth Trumpet could sound any day now, because we “must have war”, proving that’s all we fallen-angels want… still. Once this happens, the way of the kings of the East are prepared. “And the number of the army of the horsemen [were] two hundred thousand thousand: and I HEARD the number of them (Rev. 9:16).” This scripture refers to the armies, 200 million soldiers, of the communist countries like Russia and China (and other eastern block countries and allies). “By these three was the third part of men killed, by the fire, and by the smoke, and by the brimstone (sulfur), which issued out of their mouths (Rev. 9:18).” This refers to the things of war. They are deadly, like the depleted uranium. The First Woe was the Invasion of Kuwait. We still war for oil (power). “One woe is past; [and], behold, there come two woes more hereafter (Rev. 9:12).” The Second Woe is upon us as we approach WW3, as warned in the beginning of Rev. Chapter 11; and what would happen if we didn’t turn around. Then, the last one, “The second woe is past; [and], behold, the third woe cometh quickly (Rev. 11:14).” Judgement Day. Now is not the time to be running around saying, the sky is falling; or running around like chickens with their heads cut off. It’s time to turn this ship around, and enter the seventh millennium with peace and prosperity, not warfare and death. We were told to follow the Laws of God, not replace them with the protocols of Satan and his synagogue. We were told about the New Song, which we should be singing loud and clear to the Heavens, showing them we choose Life, its Blessings, and not Death, and its Curses. The New Song is the Song of Moses and the Song of the Lamb, combined harmoniously together. It’s the Law, those commandments and guidelines given to Moses and those given to us by Christ. Separating God and State – removing God from every aspect of our lives, which was inspired by socialist ideas of Marxist communists, was the last thing we should have ever done. We are Cursed. And the Curses are getting more and more frequent and widespread. The floods, fire, war, famine, slavery and death, that we were promised for straying away from God, aren’t going to change under Satan’s rule with his elite synagogue. Humans, animals and the environment are being poisoned, not only from depleted uranium, but dozens of other toxins introduced into the air, water, soil, food, and vaccines by insane so-called scientists, that’s without mentioning all the GMOs, Frankenfoods, and pesticides. No, this isn’t a pretty picture. Neither are photos of little babies with massive deformities caused by US. We did it; we started the fire; Mankind, with his weapons and war; shouting “more power to him”, the Great Destroyer! We have mutated into monsters the prophets couldn’t recognize. Let us question the propaganda that low-level radiation is harmless. Why do we need study after biased-study, that take years and years to conduct, to INFORM us of what we already know. We are Cursed. There are huge claims against companies making DU weapons, but this is a good-ole boy system. We see it day after day, year after year – money talks and dung walks. But it’s going to hit the fan. We have been warned and warned. The evil has got to stop. If we aren’t going to stop it, the Heavens will. But that means not many make it back Home, only a chosen few. Once, we considered simple things blessings. A dad’s prayer was to have a healthy baby. A farmer’s prayer was to have a healthy crop. A fisherman’s prayer was to have a full net and calm-weather. A rancher’s prayer was to have fattened cattle. A family’s prayer was to have a home. A nation’s prayer was to have peace. These were simple treasures that gave us inner peace from The Almighty – a blessing that all was well. When did we start praying for oil and pipelines and materials from other countries, when Father had provided us with all we needed? Who conned us, convinced us otherwise? Who told thee thou wast naked? Same answer.